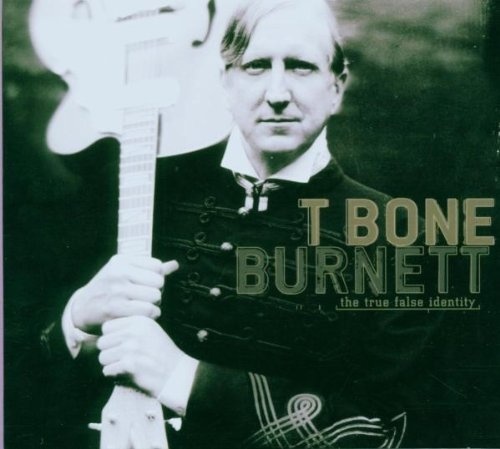 As a musician and songwriter, T-Bone Burnett often manages the canny feat of seeming direct and elusive at the same time; there's an emotional power and clarity in his best music that's bracing, passionate, and scrupulously honest, but he's also capable of using his artifice to throw his messages in several directions at once, and it's sometimes difficult to tell just what his intended target is supposed to be (which is part of what makes his work fascinating in the first place). Usually, this gift works in Burnett's favor, but his aim seems less precise than in the past on The True False Identity, his first album since The Criminal Under My Own Hat in 1992. Since he last cut an album as a frontman, Burnett's star has risen considerably as a producer, having coordinated the multi-platinum soundtrack albums for O Brother, Where Art Thou? and Walk the Line as well as breakthrough projects for Counting Crows and the Wallflowers, and Burnett's estimable skills in the studio are the best thing about The True False Identity. Three drummers are credited in the liner notes (Carla Azar, Jay Bellerose, and Jim Keltner), and it often seems as if all three are playing at once, as a precisely arranged clatter runs throughout these 12 songs, with Dennis Crouch's double bass keeping the rhythms locked in and Marc Ribot's superb guitar work carrying the brunt of the melody and conjuring the aural atmosphere (enough so that he could probably demand co-star billing if he were of a mind). Musically, The True False Identity is fascinating and challenging stuff, but Burnett's songwriting is decidedly below par here; the album is full of the sort of clever wordplay one would expect from Burnett, but a number of the songs cover themes he's written about more effectively in the past (especially "Blinded by the Darkness" and "Hollywood Mecca of the Movies"), and while the themes may remain relevant, that doesn't make these salvos hit their targets any more cleanly. Too much of Burnett's writing on The True False Identity sounds like slogans rather than carefully thought-out verse, and while they're often great slogans ("If sin were dealt with by the laws of man, everybody would be in jail," "Cowboy with no cattle, warrior with no war/They don't make imposters like John Wayne anymore," "When you're out for revenge, dig two graves"), the result is a bunch of excellent moments that don't add up to a satisfying whole. From nearly anyone else, The True False Identity would be a striking and adventurous work, but given Burnett's body of work, there's no arguing he can do better, especially after a 14-year layoff, and this is a genuine disappointment from a artist of this caliber.